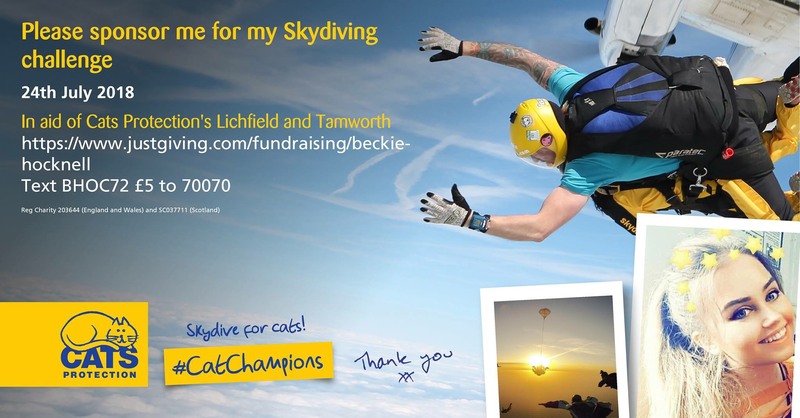 Beckie and Saffron are bravely doing a skydive to raise funds for Cats Protecction. Please sponsor them in doing their skydive on the 24th July 2018. All funds raised will go towards cariing for our cats and kittens in care. Just £5 can supply 10 days worth of specialist milk to hand feed an orphaned kitten. Just £10 can provide a traumatised cat with bedding and a safe place to sleep. Just £10 can feed a cat in our care for a month!